BOOKS WORTHY OF YOUR STORY. but cherish after it's filled with the world inside your head. whose thin pages tear and tatter as you create. one you’ll cherish for years to come. you need a book that helps you tell it. I’m here to make that happen. I’m Jenna, the bookbinder behind Kitty Cat Stevens. and I knew I had to share them with the world. To my fellow artists, writers, designers, poets, list makers, and scribblers: thanks for letting me share my passion with you — I hope you fill these books up with yours. "The degree to which Jenna is good at what she does is absurd. Jenna made for me. That journal is the book version of me. If you'd like to join the fun, just enter your email below and you'll be the first to know when the Kitty Cat Stevens ready-to-ship designs are available. 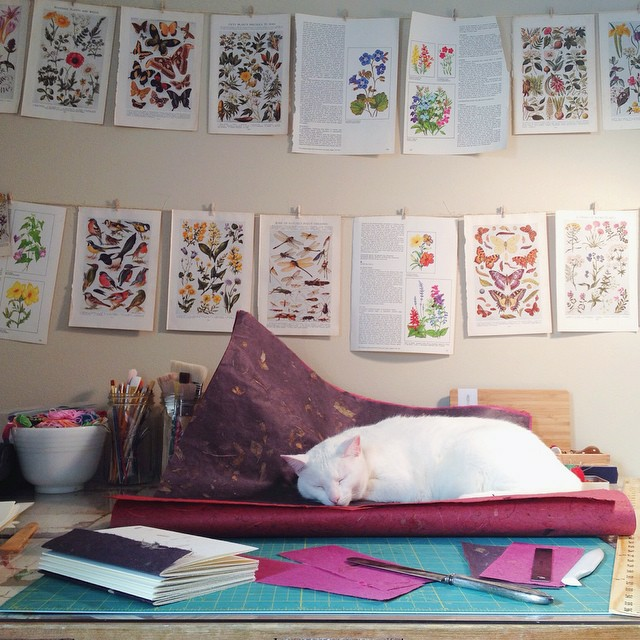 A bookbinder living in Nashville, TN. I’m on a mission to fill the world with handmade books as unique as the people who use them. I want nothing more than to create the perfect home for scribbles — and to share those homes with others. I combine my obsession with details, embroidery, and all things vintage to create delicate hand-stitched books destined to become heirlooms. My books have been featured in Smitten Magazine and 100 Layer Cake, among others. I'm currently creating inventory for my handmade book shop, and sharing that process on my blog as well as Instagram. If you like what you see here, subscribe to the Kitty Cat Stevens newsletter to keep in touch.